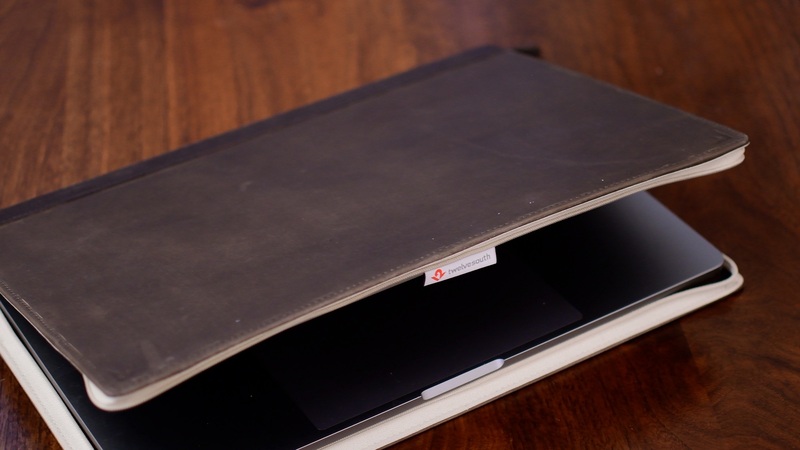 The BookBook case would by all accounts be the flagship product of Twelve South. They continually update it, year after year, for nearly all of Apple’s products. This latest iteration has a few design changes that are very much appreciated, as it is modified to work with the new MacBook Pros. The BookBook is hard to define. Is it a sleeve? A shell? A case? I’d say something of a mix between all of those. In any case, it offers protection to your MacBook Pro. Not just by dampening the blow if it would fall, but by disguising it as a vintage book in an effort to go unnoticed by would-be thieves. While it does pull it off quite convincingly, the illusion is somewhat spoiled if you look around the edges and see the zipper. It would fool a passerby or a thief in a hurry, but won’t stand up to much inspection. I’d say the book design is more because it looks cool, than to actually fool anyone. This second generation BookBook has 3 major changes over years past. To start, it is now 42% slimmer, which is in large part due to the svelte size of the new MacBook Pros. The spine also has increased support and is more crush resistant. You tend to grab the spine a lot while carrying it around, or when stuck in a bag. This will help it hold up much better. It’s also got a new design on the spine, so it can stand our from past iterations. Lastly they’ve added a secret document pocket below the machine. You can’t hold a whole lot of papers, but it is perfect for some color swatches, a resume, or a couple documents for a meeting. For starters, I still love the look of the BookBook series. I’ve loved them since I first saw them. I thought they were clever, expertly made, and unique. None of that has changed. But my biggest problems always were the weight and size. It’s one thing when it is an iPad, or even your phone. Size isn’t as crucial. The 15″ MacBook Pro is quite large, and when it is thick too, it’s a bit hard to tote around. With these new MacBooks, it’s significantly easier to carry. I really like the idea of the document pocket, but I don’t have much a need for it. I don’t carry a lot of paper with me, but I feel like it would be really great impression piece to take to an interview, with resumes tucked inside. Anytime I have paper, I feel like I would also like to have a pen. 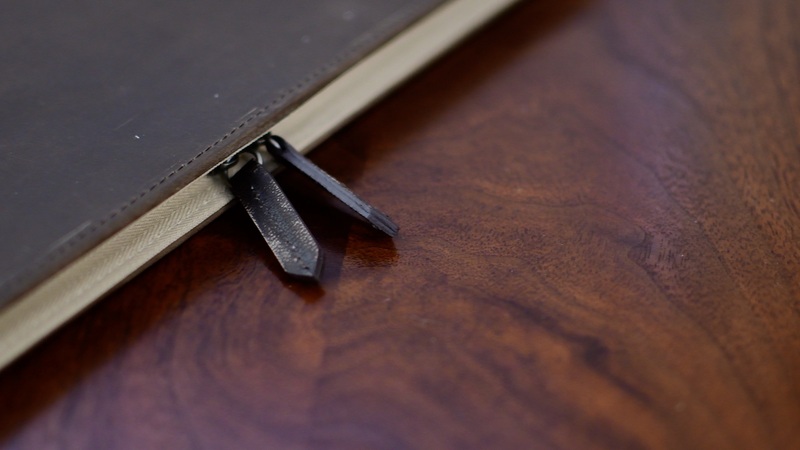 Unfortunately there is no free space for a pen to reside inside of the BookBook. 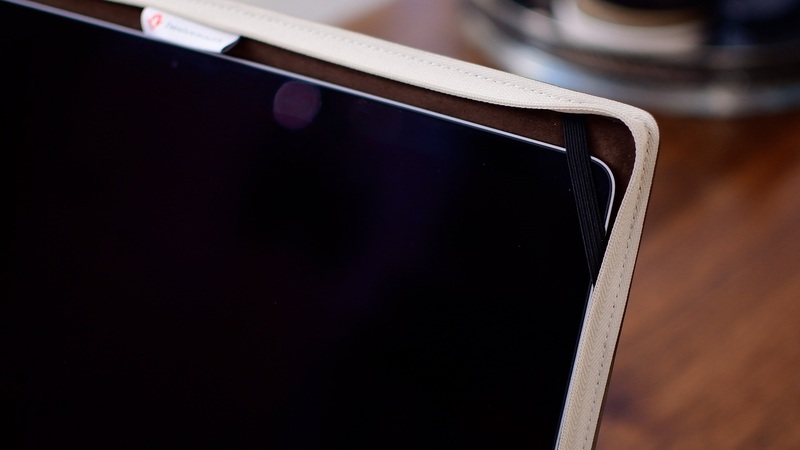 To secure the BookBook to your Mac, there are two elastic straps along top. One for each corner. As each MacBook has thinner and thinner bezels, it makes this harder to do. There just isn’t a lot of corner space for those straps to secure against without getting in the way of the display. The farther you push the display back, the tighter the elastic, and the more it is out of your display. Some part of me feels like this is the MacBook that the BookBook was made for. It has a new design that adds more features and is better than ever, the smaller silhouette makes carrying it around more realistic and and it still offers the same great design and protection it has for years. That said, the vintage book aesthetic will probably not be for everyone. I’m sure it won’t fit some personal styles, but for those it does, you can’t go wrong with the BookBook Vol. 2. If you fall into the category of people that have a new MacBook Pro, and love the vintage style of the BookBook, you can find it on Amazon for $79. If you love the design, but don’t have the new MacBook Pro, don’t worry, they make it for many of your other devices like the iPhone and iPad.